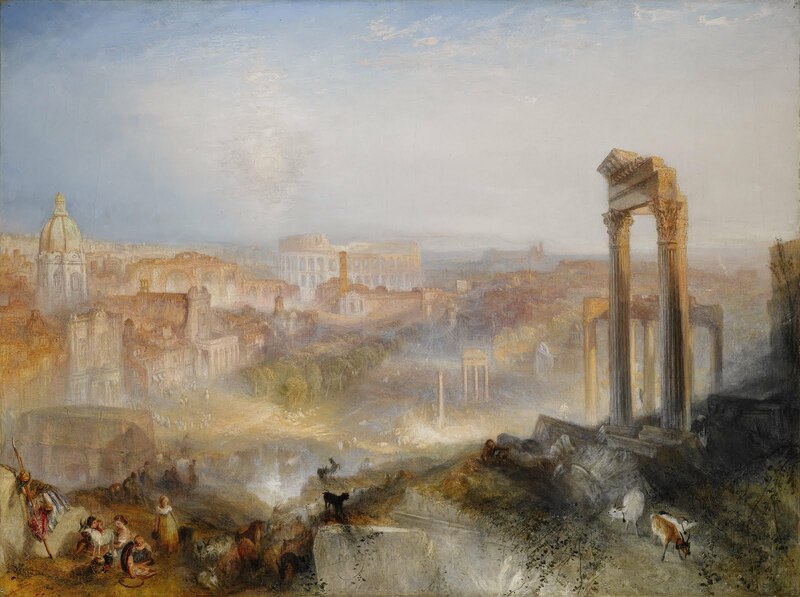 Getty Secures Export License for "Modern Rome—Campo Vaccino"
This landscape by JMW Turner has been granted an export license from the UK Culture Ministry. The painting had been on display for the last thirty years at the National Galleries in Scotland, on loan from the Primrose family. 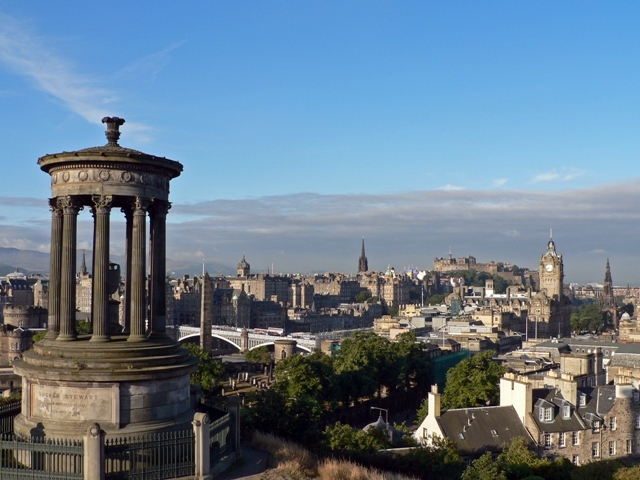 For me, the work fit well in Edinburgh, echoing nicely that city’s neoclassical architecture. It was always one of my favorites, a reason to stop in to Scotland’s national gallery. Turner’s depictions of classical ruins and renaissance buildings echoed Edinburgh’s own neoclassical features. Now the work is on its way to Los Angeles. Is it so closely connected with our history and national life that its departure would be a misfortune? Is it of outstanding aesthetic importance? Is it of outstanding significance for the study of some particular branch of art, learning or history? But “Modern Rome” is coming, perhaps a sign that at a time of austerity in Great Britain, a domestic arts economy that’s far more reliant on government funding than in the United States could not muster the wherewithal to take the painting away from the privately and lavishly endowed Getty. In 2004, according to a BBC report, the British government anted up more than half the money to match the Getty’s bid for “Madonna of the Pinks,” tapping a fund from lottery receipts that’s earmarked for cultural purposes. Mike Boehm, Getty Museum’s $44.9-million purchase of J.M.W. Turner masterpiece is final as sale clears U.K. export hurdle, LA Times Culture Monster, February 3, 2011, http://latimesblogs.latimes.com/culturemonster/2011/02/getty-jmw-turner-masterpiece.html (last visited Feb 4, 2011). Author Derek FinchamPosted on February 4, 2011 Categories UncategorizedTags Edinburgh, Export Restrictions, JMW Turner, The Getty, Waverley Criteria1 Comment on Getty Secures Export License for "Modern Rome—Campo Vaccino"
This watercolor by JMW Turner, “Blue Rigi” was sold at a Christie’s auction in June, 2006 for £5.8 million. Here is an article from the Guardian, discussing the sale at auction, which set a record for the highest price ever paid for a British watercolor. The buyer’s identity is, of course, a complete mystery. The work has been deemed of Waverley quality, and thus export of the work has been temporarily delayed to allow British institutions to raise enough funds to keep the work. The arts minister, David Lammy placed a temporary restriction on the work until July 22, but that delay has been extended until March 20. That may not be the final date though, dates have been extended in the past to allow for money to be raised. The arts minister should be very wary of extending the date too long though, as the private purchaser may decide to challenge the legality of the whole scheme as a violation of human rights. The law authorizing the ban was actually an emergency provision passed in 1939 on the eve of the Second World War, and was later adapted to allow UK institutions a chance to raise funds to buy the work. One consequence of this rather haphazard system is the reliance upon the ability of the interested parties to raise enough funds. That becomes increasingly difficult as the price for art increases. Also, if the seller of the work chooses, she can simply decide not to sell the work. The only example I’m aware of the Waverley Criteria temporary export prohibition being challenged was in 1994 when the Getty tried to challenge repeated extensions to the ban on the export of the Three Graces which is currently jointly owned by the Tate and the National Gallery of Scotland. This also draws strong parallels to the recent successful efforts to prevent the Gross Clinic from leaving Philadelphia. At least that work was publicly displayed. This Turner is privately owned, and not displayed to the public. How has the cultural heritage of the UK been damaged if a seldom-shown work is sold to a different individual in another country? I think that “saving” this work is a bit of a misnomer, especially considering two slightly different Rigi’s exist, one displayed in Australia, and another in the US National Gallery. If nothing else, the campaign to purchase this work is really ingenious. One wonders why it took so long, but in the last few days the Art Fund has just initiated a really creative fund-raising project. One can choose to “buy a brushstroke” for as little as five pounds, and the website gradually shows how much of the work has been “saved”. I suppose the market will decide. If you think the cultural patrimony of the UK will be forever tarnished by allowing the work to be owned by a mysterious foreign individual, you can donate to the effort. So far, £25,214 has been raised. Hopefully the seller will not choose to keep the painting if the funds are raised.